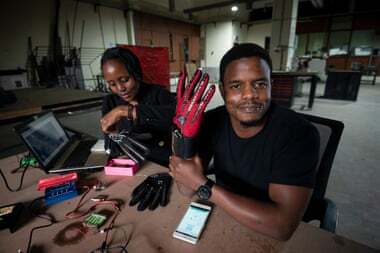 Roy Allela, a 25-year-old Kenyan technology evangelist, has invented smart gloves that convert sign language movements into audio speech. According to Allela, his inspiration to build the technology was inspired by the need to communicate with his 6-year-old niece who was born deaf. Allela disclosed that his niece found it difficult to communicate with her family since none of them understood sign language. The gloves – named Sign-IO – have flex sensors stitched on to each finger. The sensors quantify the bend of the fingers and process the letter being signed. The gloves are then paired via Bluetooth to a mobile phone application that Allela also developed, which then vocalizes the letters. “My niece wears the gloves, pairs them to her phone or mine, then starts signing and I’m able to understand what she’s saying,” Allela stated. Allela also commented that like all sign language users, her niece was very good at lip reading thus did not require him to sign her back. He also revealed that the speed at which the language is converted into audio was one of the most important aspects of the gloves. “People speak at different speeds and it’s the same with people who sign: some are really fast, others are slow, so we integrated that into the mobile application so that it’s comfortable for anyone to use it,” he divulged. Furthermore, users can also set the language, gender and pitch of the vocalization through the app, with accuracy results averaging 93 percent. More importantly, Allela stated that the gloves can be packaged in any style that the user wanted such as a princess glove or a Spider-Man one. “It fights the stigma associated with being deaf and having a speech impediment. If the gloves look cool, every kid will want to know why you have them on,” commented Allela.